Lakeshore Adventures kayaking is like no other! Kayaks are the smooth and easy way to navigate clear Door County waters. We help you select the right rental kayak based on your age, size, experience, and the tour you’re going to enjoy. You’ll love simply gliding along, taking in the landscape and wildlife. Available in single or tandem, our sit-on-top touring ocean kayaks are extremely maneuverable. Single kayak maximum weight is 300 lbs. ; tandem is 550 lbs. Have kids? We’ll recommend the best configuration for your family, likely a tandem with one adult/one child. It’s all about having a good, safe time. Note: our clear bottom kayaks are only available for a Shipwreck Tour. Other tours include the Cave Tour, Bluff Tour, and Wildlife Refuge Tour. Wear: Polyester, spandex, swimwear, or quick-drying clothing, water shoes or sandals. Wet suits are available to rent during cooler weather. Bring: Bottled water and sunscreen. We provide the life vests. 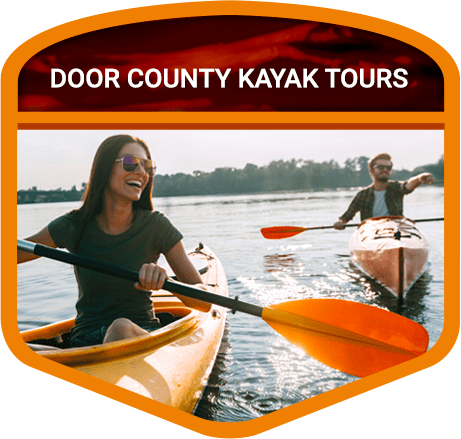 Door County has so much to see, we had to make 4 kayak tours.